Rockhampton Zoo keeper Wil Kemp with the mate of the stolen freshwater crocodile. THEY were after a cuddly koala, now a city-wide hunt is on for a crocodile stolen from Rockhampton Zoo. The bizarre theft stunned zoo staff and is believed to have taken place early yesterday morning. Police yesterday charged a Rockhampton woman with stealing in relation to the incident. 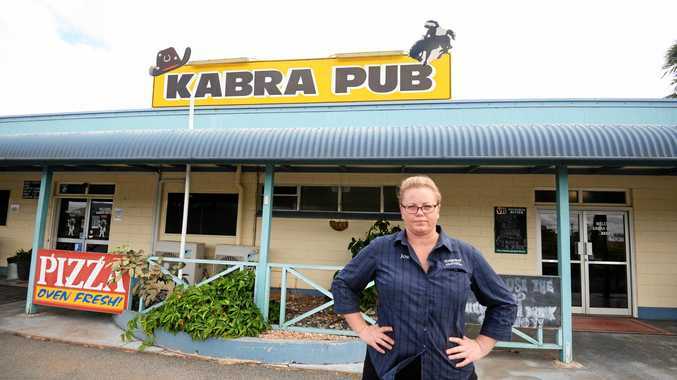 Rockhampton Zoo keeper Wil Kemp said he was first alerted to the theft after an early morning call from police, who were acting on an anonymous tip-off. Mr Kemp said it was believed thieves took the 1.2m croc, which was last seen on Sunday, after koalas fought back. ? "Koalas can be quite defensive .?.?. they are equipped with sharp claws and teeth,'' Mr Kemp said. "The female croc was one of two freshwater crocodiles that we have had here for at least 10 years. He said it was feared the crocodile, which would be worth no more than $600, had been sold for drug money. 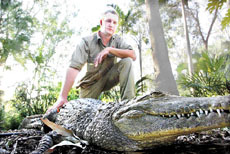 "A lot of people love these crocs and it's angered volunteers,'' Mr Kemp said. He said the crocodile, which shared a pen with a male freshwater crocodile about the same size, was one of three kept by the zoo. The other is a larger saltwater croc called Charlie. It was hoped the stolen croc and its mate would breed for the first time later this year. Rockhampton police said the charged woman, in her early 20s, was given notice to appear before Rockhampton Magistrates Court on Friday, April 14. Police also want to speak with other people believed to be involved. Rockhampton City Council director of parks Tom Wyatt said the council would look to beef up security around the zoo after the incident. Mr Wyatt said while there was no physical evidence of a breakin, thieves could have used a stepladder to negotiate the 2.4m perimeter fence. The crocodile was also in a fenced pen. He said a thorough search of the zoo was conducted and the crocodile was not found. Anyone with any information should call Crime Stoppers on 1800 333 000 or Rockhampton police on 4932 1500.